To investigate the correlation between the preoperative CT findings in diagnosis of gastric bare area (GBA) invasion and the 3-year-overall survival (OS) of patients with proximal gastric carcinoma (PGC). 108 consecutive patients with PGC confirmed by biopsy underwent MDCT scan prior to gastrectomy were enrolled retrospectively from Dec 2009 to Dec 2014. 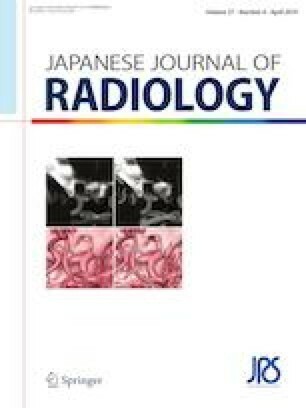 GBA invasion in PGC were evaluated by measuring the direct CT signs including transmural involvement and lymph nodes in the GBA. The indirect signs were also evaluated including the infiltration of the diaphragm, gastrophrenic ligament and perigastric fat. Kaplan–Meier estimates with log-rank test and Cox proportional hazard model were used for analysis. The two raters achieved excellent agreement. Univariate Kaplan–Meier estimates indicated that postoperative chemotherapy (p = 0.003), transmural involvement (p < 0.001), lymph nodes in the GBA (p = 0.015) and cT staging (p = 0.002) were associated with OS. Cox proportional hazard model indicated that the transmural involvement (HR = 8.194, 95% CI 2.15–31.266), diaphragm involvement (HR = 0.21, 95% CI 0.042–0.986), perigastric fat infiltration (HR = 0.125, 95% CI 0.018–0.885; HR = 0.02, 95% CI 0.001–0.264), and cT staging were independent prognostic factors for OS. CT findings of GBA invasion in patients with PGC, not only the transmural involvement but also the indirect signs are independent prognostic factors potentially, which should be given more emphasis in future clinical practice. This study was supported by Beijing Municipal Administration of Hospitals Clinical Medicine Development of Special Funding Support (no. ZYLX201803) and Beijing Natural Science Foundation (7172049). Y-SS is acting as the guarantor of the article, and was responsible for the study design and for preparation of the manuscript. R-JS and LT were responsible for the study design and data collection. X-TL and Z-YL were responsible for development of methodology. All co-authors had input into study design, conduct, data analysis or interpretation. All co-authors critically reviewed the manuscript, and necessary revisions were made to accommodate their suggestions and opinions. This retrospective study was approved by the institutional review board of our institute, and the requirement of informed consent was waived.